For the Hmong people of China and Southeast Asia styles of traditional clothing create a visible distinction between different subgroups. For example, the major Hmong subgroups of northern Laos, Green Hmong and White Hmong, are easily identified by the color of women's pleated skirts - the indigo blue, of the Green Hmong (sometimes called Blue Hmong), and the plain white skirts worn by the White Hmong. Women of the Green Hmong subdivision traditionally wear knee-length pleated skirts of hand-woven hemp cloth, which they decorate using a batik and indigo dye process. Batik is a wax-resist technique in which a design is drawn on the cloth using hot beeswax, applied with "waxing pens" of different widths. The geometric design is waxed directly onto the cloth entirely from memory without first laying out the pattern in pencil or pen. After a skirt panel (more than six yards long) has been completely waxed, it is dyed a deep blue by repeatedly dipping in a homemade indigo dye bath and drying in the sun. Because indigo is a cold water dye bath the waxed design remains intact, protecting the white cloth from the blue dye. Once the desired color depth is achieved the wax is removed by boiling, revealing the delicate white design. Traditionally, a young girl slowly learns this skill by watching her mother and grandmother. The best batik artists in a village are highly regarded. 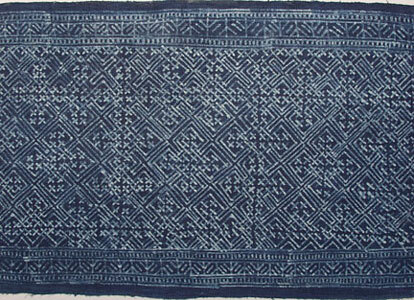 To learn more about Hmong culture visit the museum's Hmong exhibit in the Collections Gallery. To experience a taste of one of their rich and colorful celebrations explore the annual Hmong New Year events held each Fall in the Twin Cities.